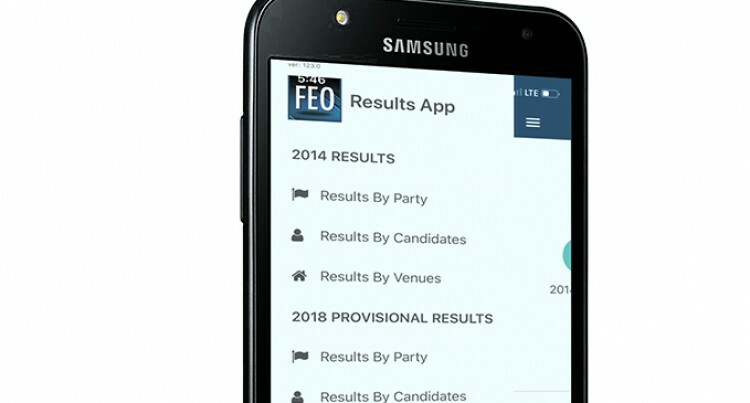 Fijians will now be able to access the provisional and final results of counting for the 2018 General Election on their smartphones and other electronic devices, including desktop computers, as they come to hand. They will also be able to view live feeds of the counting process and the Fijian Elections Office (FEO) warehouse where ballot papers are stored. This is after the FEO launched its Results App at Suvavou House in Suva this week. “I expect the news media to find this quite helpful in their election coverage and analysis of results,” said Suresh Chandra the Electoral Commission Chairperson. Supervisor of Elections Mohammed Saneem said the Results App would only give results already entered in the Result Management System. This will not include any data entry from the field. The public can access the results by party or candidates or results by venue after the data has been entered in the Result Management System. “So in terms of party results it will display results for each party, percentage of votes that they received in various divisions, overseas categories as postal votes,” said Mr Saneem. The App would give information on valid and invalid votes for each polling station. There will be a statistics tab to show the turnouts chart. Mr Saneem said after the 2018 General Elections, the provisional results will be uploaded in bulk to the App. This means the public will not be able to see the polling station results in bulk. It will only show the votes for each party and candidates. But, after the final results are entered, Fijians will be able to access the breakdown of results. The FEO will have live feed on the Election Day for this year. Mr Saneem said this was an issue of transparency. “Last year we promised the public that we will make some of our processes publicly viewable,” he said. Mr Saneem showed a live feed demo of the FEO warehouse at Laucala Beach Estate, Nasinu, on Fiji Elects 2018 (https://m.facebook.com/FijiVotes2018/) – one of the two Facebook pages operated by FEO. The FEO celebrated its 4th anniversary of its quarterly newsletter, Lavetiviti, yesterday. “This is the first full cycle of operations of FEO from one election to another and it is momentous and deserves recognition,” said Mr Chandra. This App would empower citizens in demystifying speculation, conjecture and fake news, says Ashwin Raj the Director of Fiji Human Rights and Anti-Discrimination Commission, who is also the Quality Assurance for Elections. “The Electoral Commission needs to be commended for this very salutary effort. This, of course, attests to the level of transparency that is expected from FEO,” said Mr Raj.